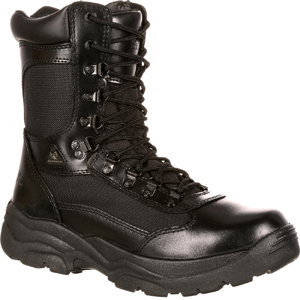 The Rocky 2149 Men's Fort Hood Zipper Waterproof Black Duty Boot is the all purpose duty boot that performs well in any environment. It features an upper constructed of high-abrasion denier nylon and full-grain leather with a polishable toe. For convenience, it features a side zipper for easy wear and removal. A waterproof bootie keeps your feet dry and comfortable. For maximum comfort, The AlphaForce features Rocky's patented Air-Port cushion footbed for excellent support and cushioning for long shifts. It also has a non-marking RigiTrac outsole with aggressive treads for climbing, rappelling, or getting you over rough terrain. Rocky Fort Hood boot sizes are comparable to your normal running shoe size. If they don't fit, email us for a return authorization and ship them back to us. We'll ship out the correct size for free!